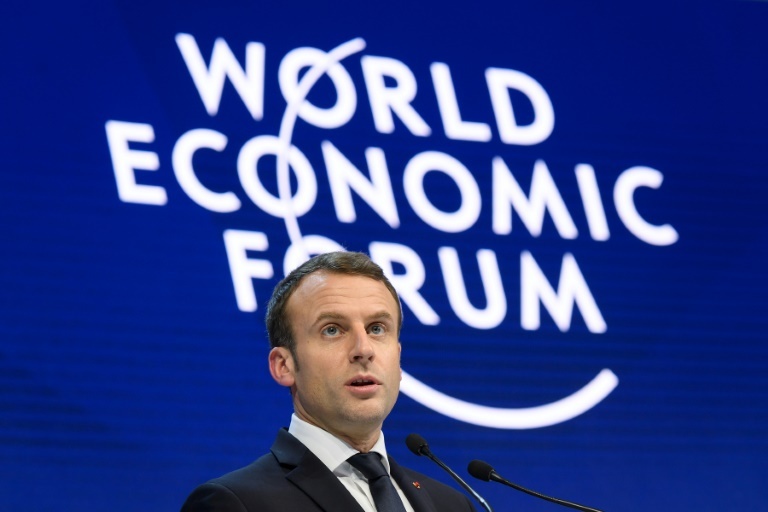 French President Emmanuel Macron made global warming a central part of his World Economic Forum speech on Wednesday in Davos, pledging to close all of his country’s coal-fired power plants by 2021. Macron’s anti-coal pledge comes as Ecology Minister Nicolas Hulot announced France failed to meet its 2016 global warming target to limit greenhouse gas emissions to 447 million metric tons. Hulot said France would revise its global warming targets to better align with its Paris climate accord commitment to go “carbon neutral” by 2050, Reuters reported. Macron has been one of the most vocal supporters of the Paris climate accord, which went into effect in 2016. Energy Transition: Does the French nuclear fleet ramp to make space for solar and wind? Why on earth would the Industrialised Country with the lowest CO2 output in the world want to cut it in the first place. The force is strong in these imbeciles. Er, the farce is strong…. ACO: see the intro. Nuclear is no good for load-following i.e. backing up intermittent and unpredictable renewable energy. And coal is doomed in France. France will have to build some gas-fired power stations as its nuclear dies of old age, unless it can come up with a better idea. That wouldn’t be to chop down and burn other people’s forests. I nominate narcissism as the great enemy of progress. The narcissist struts and frets, “it is a tale Told by an idiot, full of sound and fury, Signifying nothing.” Of course, who but a narcissist would run for President? Redeeming qualities are a sine qua non. Tokyo experienced its heaviest snowfall in four years on Monday, and other parts of Japan will see sea-effect snow pile up through this week. This weather pattern also allowed Tokyo to experience its coldest temperature in 48 years this week. Private jets, personal helicopters, fleets of limousines and canapés made from shark. No, this isn’t a Rich Kids of Instagram shopping list. It’s a weekend in the life of one of the many billionaires preaching the Green Lobby’s agenda at the World Economic Forum (WEF) in Davos this year. Nuclear can do load follow, as designed for a normal predictable demand situation. Introducing intermittent and unpredictable renewables from wind and solar is a folly of the greatest stupidity. Yes, this is why France with all its nuclear plants has or will have a problem moving to more renewables, as Craig Morris pointed out. With Merkel too busy in Germany frantically trying to meld some form of government from any of the dispret political and social parties of her nation, the part of voicing and reinforcing EU interests falls to the Mekon Macron. So he’s just acting as a mere functionary to the unelected EU elites of the mighty European Council. He’s just virtue signaling their crony capitalistic desires. Mouthing pledges that are as practical, and have all the substance as knitted smoke. So far it looks like the EU elite wants to be beholden to Vladimir Putin and his Russian gas, I wonder how the backhanders work in that deal? The French idea is to replace about a third of their nuclear power with wind turbines to reduce emissions? How does that work? The French nuclear does do some load following as their plants are of 3 sorts. The oldest just keep running, the second sort modify output with control rods etc. and the third type just send steam direct to the cooling towers bypassing the steam turbine. If output is still too high then they can drop the price and Switzerland (and others) can use it for pumped storage. The problem with their plan is that too much wind will force a price drop making the remaining nuclear unprofitable. Alternatively not enough wind with force France to buy on a market with other wind believers also increasing demand (which won’t reduce the cost). After heavy snowfall in the Pyrenees, very heavy snowfall begins in the French Alps. Always amazed that the French were among the first to include nuclear as an important part of their electric utility structure. Lets hope they haven’t lost their senses. The main problem with steam diversion from the turbines, is keeping the blades warm. The thermal shock induces microfractures. Creating failure points. You don’t want that in a nuke plant. Sooner or later a failure will occur. France’s problem is that they don’t know how to replace a reliable grid with an unreliable one. Green crazies apart, I think one of the key problems is that a stable system producing low cost energy into the foreseeable future…doesn’t produce exciting projected financial returns. While I fully support capitalism, there will always be those who wish to destabilise the current status quo in a given market for selfish reasons. Energy, like water supply, is an essential commodity, but with low growth potential. So what would operators in that market do? They will try to disrupt the functioning market, à la Enron. It seems like the most logical explanation of why the French ‘government’ would want to change from an existing system of cheap electricity supply to one of expensive electricity supply when even global-warming mantra says that it is insane. Carbon dioxide targets be damned, the French approach strikes me as the most insane at the moment. And that includes the insanity of Germany, California and South Australia. They will not feel the pain as soon, maybe, but their incredibly steep descent from a comfortable place will make for good viewing.